Jobs in supply chain management are the top paid jobs in Canada. 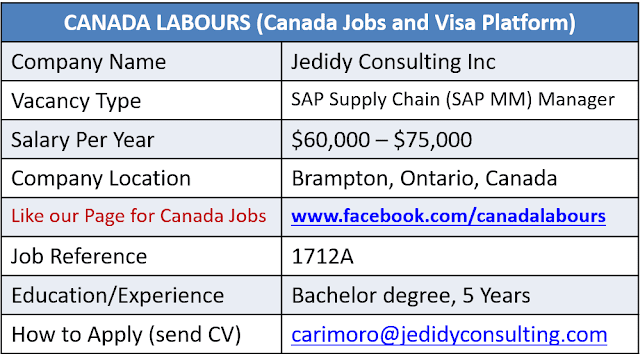 We Canada Labours offering Free Job in Canada to our visitors Across Globe. We Jedidy Consulting Inc provide a bouquet of business and technology innovation services to support our clients demand for technology-enabled business transformation. SAP implementation (Systems, Applications & Products implementation) is the whole of processes that defines a method to implement the SAP ERP enterprise resource planning software in an organization. Our SAP specialists deliver the technology and services to help our clients meet business performance goals and improve processes locally and internationally. 1: Take a lead role in the delivery and management of consulting services to high growth organizations with a diverse team of Consultants. 2: Manage interface with local teams and client delivery teams spread globally. 3: Create long term relationships at a senior client level and key stakeholders. 4: Execute a client service plan on complex engagements. 5: Identify and lead business development opportunities. 7: Create a learning environment through leadership. · Leading and supporting SAP Supply Chain integration pursuits and practice development initiatives. · Pursuing new business development opportunities. · Building strong business relationships with potential clients at a senior level. · Leading the delivery of solution based SAP Supply Chain integration consulting services to large public and private sector organizations. · Developing the corporate brand of the company as a preferred technology partner through seminars, Point of View papers, and representing the company at key partner meetings. · Promoting and fostering collaboration within the office as well as with client counterparts particularly those in global delivery centers with varied culture and knowhow. · Acting as a trusted business advisor. · Leading, managing, developing and coaching team members. ü Completed undergraduate degree in computer science, business administration, commerce, economics or related field is required. ü Minimum 8 years of overall combined relevant SAP Supply Chain experience is required. ü Minimum 5 years of experience building and leading a team in a consulting practice is required. ü Minimum 5 years of experience in SAP Supply Chain Project Management or Program Management is required. ü Strong business process knowledge demonstrated by business process management, design, and implementation experience is required. ü Ability to lead teams in architecting solutions is required. ü A strong market development experience is required. ü Strong commitment to professional client service excellence is required. ü Excellent interpersonal relations and demonstrated ability to work with others effectively in teams are required. ü Superior verbal and written communication skills are required. ü Ability to develop and present new ideas and conceptualize new approaches and solutions is required. ü Proven analytical skills and systematic problem solving are required. Job Location: Company is located in Brampton, ONTARIO. Salary: $60,000 - $75,000 / Year. If you have the skills and experience which is required for SAP Supply Chain Management position, please forward your resume to below Email Address. Shortlisted Candidates will receive confirmation email. 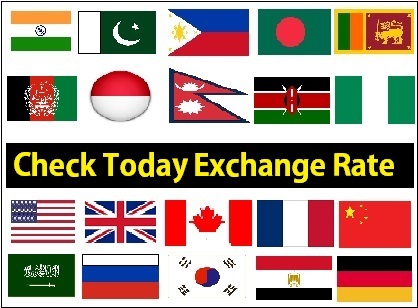 Last Words: We are new in Market, there is no Sign In, Sign Up or Registration Required on our Site, just find the Email Address or Company Link to apply Direct. Please support us by Sharing our Posts with others, we are requesting you to Like our Facebook Page, Follow us on Google+ and Subscribe us to get free Jobs in Email. Canada Jobs is our Target, we are providing 100% confirm and Free Jobs in Canada to all of our visitors across Globe.